Forestry is an industry which was once considered an example of a sustainable activity. Forests were growing naturally and spontaneously. The role of the forest managers was to maintain forest continuity whilst simultaneously producing timber for society. Because of this process, the logging was interpreted as an important management tool for how to maintain sustainability in the forest. Currently this model of sustainable forestry is under serious threat. Many people visiting Slovakian mountains are asking the question: how is it possible that areas protected under national and international legislation, are being logged? Slovakian National Parks, Natura2000 sites, many areas that focus on nature conservation, do not have the protection they need. There are several reasons why not. Looking at this issue from the legislative perspective, logging is not compatible with the primary purpose of protected areas – to protect nature! Logging leads to a massive loss in biodiversity. From the sustainable use perspective, large scale logging effectively means depriving our children of forests in the future. And ecologically, the current scale of logging is alarming as it accelerates global warming. Strictly protected natural reserve (Bielovodská valley) in oldest National park in Slovakia – High Tatra mts. National park. Forest in Slovakian protected areas is managed by the Ministry of Environment and the Ministry of Agriculture and Rural Development. Two contradictory laws applied – Environmental law and Forestry law and that cause chaotic situation. Forestry law is often contradictory also to Natura 2000 legislative and overriding either Environmental law or European Union legislation. Result is the salvage logging in protected areas and planting of unnatural “forest”. Slovakian foresters often claims, that they are protecting forests from bark beetle, but the way they do is suppressing natural dynamics and postponing regeneration of natural forests. The result is that currently a large part of many protected areas is clearcut. Walking in these protected areas is often like walking through land recovering from war. Overturned land and mud runs into the channels left by forest tractors after logging. There is dirt, oil spills and massive erosion. It is something that should not happen in protected areas. 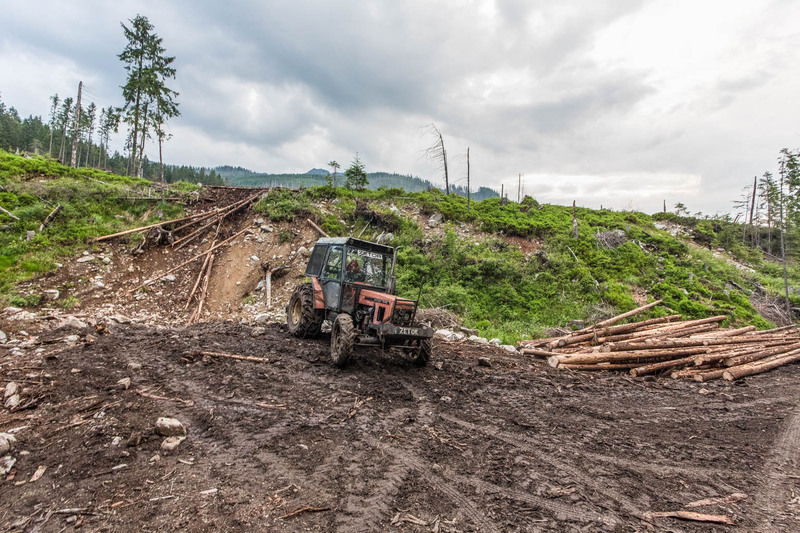 The current intensity of logging inside Slovakian Protected Areas is unprecedented. Logging today is more intensive than in the 18th century, which is a time when the majority of forest in Slovakia disappeared because of a huge need for timber and land for agriculture. Forests which spontaneously restored in the last 200 years, which could fall into the criteria for high-quality European Wilderness, is disappearing. Slovakia, recently very proud for its extensive network of protected areas, has less and less chance to contribute to the European Wilderness Network. Slovenská vláda + parlament = banda skorumpovaná mafiánska. Sad and frustrating! I would be interested to hear what the sanctions will be. it seems that forestry practices in Poland and Slovakia are fundamentally different. I am wandering why? Is that embedded already in the forestry education…? This is very frustrating to hear.